The Hudson Valley is known for having hot, humid summers and bitterly cold winters. To keep up with the fluctuating, and sometimes extreme seasonal weather changes, you need both a dependable HVAC system and a professional company to rely on. 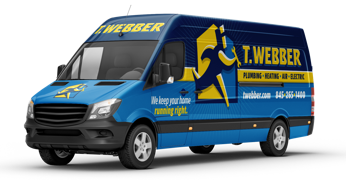 T.Webber has been providing the Hudson Valley with innovative and customer-focused heating service for nearly 30 years. Dedicated to our craft, our team of licensed and insured HVAC Experts will work hard to ensure your family is comfortable all year long. Whether dealing with a heating system failure on the coldest day of the year, installing a new high-efficiency heating system to help cut utility costs, or completing preventative maintenance to ensure your system is operating safely and efficiently, our team is committed to serving at the highest level. At T.Webber, your comfort is our number one priority. From your initial call to the office, our team will ensure your issue is dealt with promptly and professionally. We sweat the small stuff – like courtesy calls before arrival, wearing booties in your home, and always leaving your property cleaner than we found it. It’s our goal to restore your comfort as quickly and efficiently as possible – often in the same day. For dependable heating repairs, high-efficiency replacements and customer-focused service, call T.Webber today.